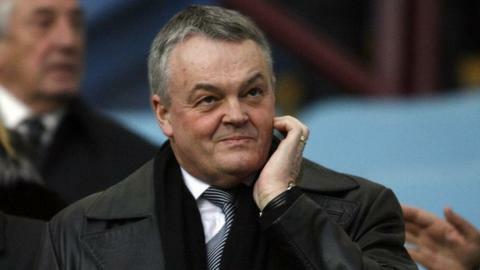 Bolton Wanderers chairman Phil Gartside has died aged 63 following a battle with cancer. He was chairman for 16 years, during which time the club enjoyed an 11-year stint in the Premier League and two Uefa Cup campaigns. "This is a very sad day for everyone," said Brett Warburton, vice-chairman of the Championship club. "Phil has been a personal friend for more than 30 years. We send our deepest condolences to all Phil's family." In November, Gartside handed responsibility for Bolton's takeover negotiations to football finance executive Trevor Birch. Birch has been trying to to find a buyer as owner Eddie Davies wants to sell, with the club £172.9m in debt. Former Bolton player and assistant manager Phil Brown recalled Gartside taking part in a training session, with a suit on, before the Sherpa Van Trophy final in 1989. "He just wanted to be part and parcel of a successful club, a successful team," Brown, now Southend manager, told BBC Radio 5 live. "To go from that to become chairman of the club in 1999 and obviously the most successful period the club has ever had, culminating in two great years in Europe... it was just fantastic for Phil and his family. Today is a very, very sad day for the club." Former Trotters captain Kevin Davies, who retired last year, said Gartside was "really ambitious" for the club. He said: "Everyone enjoyed the journey. To be around, he was kind and looked to put his arm around the players." Davies said people may have differing opinion about Gartside's legacy but said he and former manager Sam Allardyce had certainly changed "the direction the club was going in". Born in Leigh, Gartside was at the helm for one of the most amazing periods in Bolton's long and colourful history. With Eddie Davies providing the funds and Allardyce the managerial expertise, Gartside helped take Bolton into the Premier League in 2001, to the League Cup final in 2004 and Europe twice in three seasons after that. A sixth-place finish in 2004-05 - with a squad that included Jay-Jay Okocha, Ivan Campo and Fernando Hierro - was an incredible effort for a club that could not rely on crowds of 25,000 even when things were going that well. Allardyce's resignation in 2007 proved to be the beginning of the end of the good times for Bolton. Though they retained top-flight status for another four seasons, reaching the FA Cup semi-finals in 2011, they never finished in the top half again. By 2012, they had gone down, relegated at the end of a desperate season. Allardyce's replacement, Sammy Lee, lasted 14 games. Gary Megson and Owen Coyle could not halt the slide. Dougie Freedman could not secure a play-off berth in Bolton's first season as a Championship club and was replaced by Neil Lennon in October 2014. Despite Davies agreeing to write off the club's debts as he looks for a way out, Bolton's financial situation has been described by Birch as "critical". That is the legacy Gartside has left. Sadly for him, it will be some time before Bolton fans can look past the current mess and remember the glorious nights against Bayern Munich and Atletico Madrid that he helped create. Had Gartside got his way, British football could have looked very different. He was a Premier League representative on the Football Association executive board in 2009, when he put forward a proposal for Celtic and Rangers to be allowed to join the English league. The plan was to form a 'Premier League Two' as a buffer for clubs - such as Bolton - who were unable to retain their top-flight status. It was never formally discussed because of opposition from Uefa and many other Premier League clubs.